The world system, through false doctrine and false teaching, would like us to believe that there are many ways to get to Heaven. God will open up the doors of Heaven and let us in. 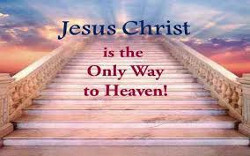 CONTINUE READING: Is Jesus The Only Way To Heaven? I reference Revelation 14: 1 - 3 for clarity on who will go to Heaven. Another scripture is Matthew 22:14 regarding the Kingdoms of the heavens. Daniel 7:13 and 14 points to the restoration of paradise here on earth.